Since its publication late last year, I have given talks about my book, What Killed Downtown? Norristown, Pennsylvania, From Main Street to the Malls at a variety of locations, from a circa 1700s mansion to a meeting room in a modern banquet facility, with auditoriums and public halls in between. My talk and signing in June of this year at the Towne Book Centre and Café in the Providence Town Center near Collegeville, Pennsylvania, however, will always stand out, for its surreal blend of both the medium and the message. It is only mildly ironic that I would speak of the death of a classic American downtown amidst a modern shopping mall. I strongly favor independent bookstores, and if a mall location is necessary for one to survive, then so be it. Thus my complete willingness to appear at the Towne Book Centre and Café. Besides, I bear shopping malls no professional ill will. The King of Prussia Mall was the prime suspect during my investigation into What Killed Downtown?, but my book does not identify it as the cause of downtown Norristown’s death. It identifies a culprit of even greater dimensions than America’s largest retail shopping center. My interest in the Providence Town Center actually begins with its causal factor, the Southeastern Pennsylvania section of U.S. Rt. 422, known locally as “the Pottstown Expressway.” The highway is itself a subject worthy of a historical case study, but it is the shopping center at its intersection with Pa. Rt. 29 that interests me more. The Expressway connects prosperous, bustling King of Prussia with Pottstown Borough to its northwest. The construction of Rt. 422 was sold to the public for its benefit to the long-distressed borough of Pottstown, with Rt. 422 cast in the role of lifeline. Of course, connecting anyone or anything to Pottstown was not the road’s true purpose, although that would have been an appreciated side benefit. This substantial stretch of highway was actually constructed to foster development in what was then still largely rural land west of the then-existing Rt. 422. The Expressway is a bypass around the traditional route, the westernmost portion of Germantown Pike, which originates in Philadelphia. By the way, the Expressway does not actually connect to Pottstown itself, but to another limited access highway, the “Pottstown Bypass,” thus allowing Rt. 422 users to ignore Pottstown completely if they wish. There is always a web of influence, both financial and political, around selecting the exact path of a road, and there always has been. The Pottstown Expressway was no exception. Close to the road’s southern end, for example, it takes a very roundabout—and thus expensive—path to avoid some very old properties, including an estate known as “Fatland” that has been around since colonial times. Whether this was due to concern for historic preservation or because its owner was Peter J. Camiel, who was chairman of both the Pennsylvania Turnpike Commission and the Philadelphia Democratic Party at the time, is officially uncertain. While how much benefit the new Rt. 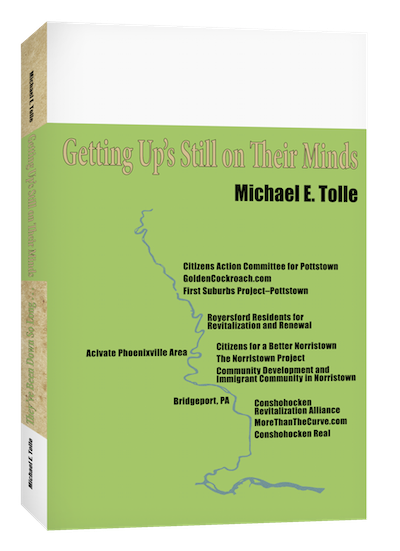 422 has been to Pottstown is debatable, there is no question as to its effect on all that undeveloped land along its path. In the final analysis the new road did what it was intended to do: earn a great deal of money for those businessmen whose good political connections allowed them to purchase land in the right place at the right time, along with those politicians with good business connections. The actual process was not nearly as simple or its profits as predestined as this short summary would indicate, however. There was never any question that the quadrants formed by the intersection of Rt. 422 with the existing roads would be prime areas for development. The devil was in the timing. The two ends of the road were built first. 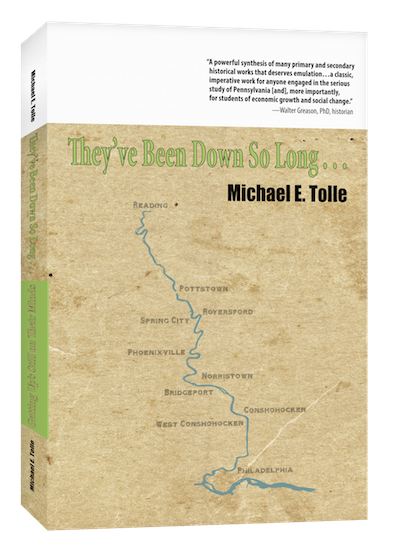 They were the bypass around Pottstown itself and a connection with U.S. Rt. 202 that included a high bridge over the Schuylkill River. Both were completed in 1967. The 13-mile gap between the two was subject to numerous delays, for a multitude of reasons. An intermediate section opened in 1978, but the Pottstown Expressway did not open from end to end until 1985. The total cost of the highway by that time had reached $102 million. Some investors had speculated early, but after the exact route of the road was known (not to be confused with “publicly known”) the jockeying for property and financing really began. The 20-year delay, with intermittent starts and stops, played hell with several of the speculators. Thus, while the eventual profit from development along the new route was basically guaranteed, the vagaries of the financial and real estate sectors served to enrich some but not others, often according to their timing. Consider the case of the Providence Town Center. It occupies the northeast quadrant of Rt. 422’s cloverleaf intersection with Pennsylvania Rt. 29. The state road is of ancient vintage, and was guaranteed an intersection (upgraded, of course, as a condition of project approval by the local authorities). The property, however, went through three owners before construction finally began (this is an enormous oversimplification, by the way). The current owner, Brandolini Properties, began construction in 2008, only to be reminded that while location, location and location is important, timing is, in fact, everything. A more or less standard mix of national-chain restaurants and retailers aligned along the periphery were the first constructed, and their accessibility and high name recognition helped to counter the economic bad times. It was a Wegman’s, however, that probably sustained the site. The company’s blend of supermarket, ethnic buffets and sit-down restaurant proved to be an immediate and consistent hit with people from far and wide. It occupies the local point of highest visibility along Rt. 422 as you approach from either direction. The interior of the center languished for some time, however, and it is that interior that drew my attention during my earlier visits (yes, to Wegman’s; I love their cheddar cheese). What rendered my talk and signing surreal during my most recent visit, however, was that as I stood and spoke, visible to me through the store windows and above the heads of my audience was the now largely open and functioning core of the Providence Town Center. That core is laid out to evoke the very downtown Main Street shopping experience that shopping malls did so much to destroy. When you first turn onto Town Center Boulevard off Rt. 29, there is little to indicate that the site is anything other than a variation of the by-now familiar layout of large box stores, restaurants, fitness centers, etc., all surrounded by large parking lots. Once past these into the center’s interior, things change. After crossing Broad Street, Town Center Boulevard itself assumes the form of an old downtown street, passing by brick sidewalks, small shops with (diagonal) street parking in front and antiquey street lamps. Town Center Boulevard terminates as the base of a “T” intersection with Market Street, the thematic climax of this deliberately-designed “downtown” core of an otherwise conventional shopping center. Dominating the intersection is a MovieTavern, complete with an old-time-evoking marquee alight with movie titles. The MovieTavern is altogether modern inside, however, taking “dinner and a movie” to a new level. Patrons can watch a movie while eating their dinner at tables. Much of its marketing is aimed directly at families. The remainder of this nostalgia layout rendered in modern colors and materials features small shops fronted by parking spaces along the “downtown” streets. There is music in the air, but not from street musicians, or even any local music store; it is piped in from hidden speakers. On a hot summer’s day there was activity out front of the MovieTavern, but not elsewhere on the streets. People were able to park near to their destination, and spent little time passing between store and car. As these small locations fill up, the diagonal parking spaces in the core will be insufficient to allow such convenience for all but the fortunate few with the right timing, but not to worry. Larger, very conventional lots lie all around the site’s core, merging with the much larger stores (and their own sizeable parking lots) along the perimeter. Providence Town Center is by no means the first such nostalgia-evoking shopping mall, simply the first in an area whose population once traveled to two real downtowns, in Pottstown and Norristown, for its retail and entertainment needs. The marketing thrust of Providence Town Center is also, in its way, a minuscule version of the oft-recurring American impulse of nostalgia/guilt. Often that nostalgia is advanced most by those who, while unburdened with guilt over their actions, had a lot to do with creating the conditions for nostalgia in the first place. The finest example of that impulse is Greenfield Village in Dearborn, Michigan. That unsurpassed ode to a vanished American lifestyle was brought into being by the man who may have had more to do with ending that lifestyle than anyone else, Henry Ford. On a more impersonal level, with an enormously lower budget and a great deal less concern for historical accuracy, shopping malls such as Providence Town Center now attempt to recreate—or at least to evoke—the very shopping experience whose death their predecessors had greatly hastened. Henry Ford possessed both the money and the longevity to artificially recreate the real thing (period items rather seriously rearranged), and Greenfield Village survives to this day, albeit subsumed into a larger theme park. One suspects, however, that these new old towns, whose authenticity is no more than plaster deep (and the plaster may actually be plastic) will experience a shorter historical trajectory than did the real old towns. Families may enjoy both dinner and a movie on a summer’s evening, but will they want to stroll down an ersatz Market Street afterward?